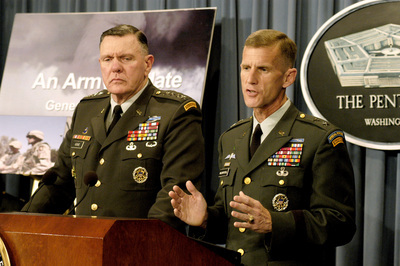 Lt-General Stanley McChrystal (right) addresses a press briefing on Iraq in 2003. "Based on Gates’ announcement, it appears that it is a signal that field commanders will be held accountable for the lack of progress in their areas. Gates spoke of LTG McCrystal’s experience as a counterinsurgent…This should not be construed as a criticism of GEN McKiernan; I think it’s more about the message than the man. I feel for the man, but I applaud the message." "The sad truth of the matter is that people have been calling for McKiernan’s head for some time now. Many of the people with whom I have spoken do not think that McKiernan "gets" the war in Afghanistan — or counterinsurgency warfare in general. There was very little confidence that — with McKiernan in charge in Afghanistan — we the United States had the varsity squad on the field. That all changed today. I do not know if the war in Afghanistan is winnable. But I do know that Stan McChrystal is an automatic starter in anyone’s line-up." Though I do not personally know General McKiernan, I have heard only positive reports about him. His replacement, Lieutenant General Stanley McChrystal, has an outstanding reputation in the special operations community. McChrystal has a solid reputation for knowing the fight. "McKiernan’s ouster signals a dramatic shift in U.S. strategy for the war in Afghanistan. And it means that the war is now, unequivocally, "Obama’s war." The president has decided to set a new course, not merely to muddle through the next six months or so." "Gen McKiernan did not look or sound like a man of the "Yes We Can" school. His fall reminds us that in the modern age people who cannot get on with foreign leaders or get their media message across are simply unsuited to high command. Gen McChrystal manages to combine the unlikely attributes of a smooth media operator (having been a Pentagon spokesman), with the fearsome battlefield reputation of being a key player in the secret world of special operations, turning the tide in Iraq."